What's in an Americanized Name? What’s in a name? Steve Levitt and economists following on his work have examined how racial differences in given names generate (or don’t) differences in economic outcomes. A new paper (PDF) by Costanza Biavaschi, Corrado Giulietti and Zahra Siddique shows that first names mattered for immigrants to the U.S. in the first half of the 20th century: people who Americanized their given names did better economically thereafter. But how to get around the possibility that those with more energy/ambition were more likely to change names—going from Giovanni to John or Zbigniew to Charles? Answer: use the complexity of the pre-change name to predict whether a person changes names; and this is a good predictor. Thus the authors show clearly that name change was the cause of the better performance of those migrants who took “American” names. I wonder if this kind of name change is as common among today’s immigrants? Decades ago it may have been an valid indicator since it was a symptom of someone wanted to "adapt" into the new surroundings; this is always good. Nowadays however, there is a new variable that counts on the workplace; value and pride on their own culture. Therefore, most likely most immigrants with the drive to succeed don't feel the need to change their names anymore as they did in the past. Anecdotally I'm familiar with several Chinese people who have adopted common names in English-speaking countries (unofficially, I think), mostly to make it easier for native English-speakers to remember their names and also perhaps a little because it is fun to pick a new name as an adult. (I'm not so sure about people actually officially changing their names, though, rather than just adopting an easy, unofficial first name.) Now that I think of it, a Polish workmate has also changed her name to an easier-to-pronounce nickname here too, while retaining her original name on official documentation. Native Hong Kongers of Chinese lineage will very commonly have two names. A "western name " and a Chinese name. Some choose to use both officially, but more common is to use one officially, and use EITHER/BOTH for conversation depending on the circumstance/audience. Interestingly/important (?) the names are NOT "Translations" since there is no Chinese version of "Robert" or "Jennifer". Still applicable but today the origin of the original name is also a factor. No need to Amrecanize your name if it is Svaard but you'll be better off doing it if your parents named you Srinavastaam. This is similar to how accents are perceived - French, Scandinavian, German are "sophisticated" whereas Spanish (read Latin American), East Asian are "second hand". I'm from Eastern Europe myself and I noticed that my accent is well-received in certain circles and rising suspicion on others. Depends on the name. If you can never pronounce it, let alone spell it, it will be a disadvantage. Saw a girl graduating high school, and she had 22 letters in her last name. Her first name was also difficult. Do you really want the first thing people notice or discuss to be how difficult it is to pronounce? Both my first name and last name throw people off (East Indian, but I'm born and raised in the US), but it's not the last name that causes issues, it's the first. Only six letters and it's not difficult to pronounce, but people have a fear of mispronouncing it so they hesitate to even try. On a small level, it's no fun going to a retail place where you have to give your name for something and they hesitate to do it or single you out by referring to you by order# when everyone else they do it by name. For that reason I give my nickname for such things, but recently I'm finding a backlash to my nickname because they don't feel comfortable saying it (it's not odd, just a Southern colloquial synonym for "dad"), although I love my nickname too. F*** me and my parents. BUT stuff gets serious when you are talking about jobs. I have no idea how many times my resume has gone in the trash simply because someone saw my first and last name and it was so foreign and they don't know how to pronounce and throw it away. I do NOT work in IT, but I do imagine that in IT having an East Indian unpronounceable name might give me a leg up against a John Smith, but again, that just goes to stereotypes. P.S. If you are wondering why I am posting my first name, it's because it's so unique that you can easily google me. I can't even find one person in India with my first name and there's a billion of us. Again, f*** me and my parents. The one positive here is what I perceive as growing respect for other cultures/languages/names. Not so long ago, if a born-and-bred American didn't know how to pronounce a foreign name or word, they'd just Americanize it, often totally mangling it. Maybe it's better to hesitate (or ask!) than to pronounce Jose and Amit as Joe-say and Ay-mitt. That analyzes mostly surnames, not given names. Reading just the first paragraph is very enlightening. 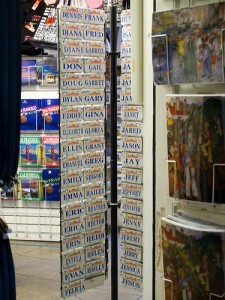 Having a good knowledge of surnames is very valuable in everyday life. My Asian friends and family all call me Daeywi. My American friends and coworkers call me David. I just got tired of explaining how to say my name. At least David is a direct translation. Don't you mean Anglicise, not Americanise? There is nothing American about John or Charles. Something similar happened to foreign immigrants of the late 19th century to Argentina. There, most of them were 'given' Spanish sounding names at the immigration port of entry -no more name signalling. Lived in China on and off for a total of 7 years and over time, I noticed a definite Decrease in the number of (Chinese) people who took on Western names. Of course many factors were in play, but I had the strong sense that , overall, (a) Westerners became less "helio-centric" - ie, Qi Lin is as valid a name as Joe, and they stopped automatically assigning English names to Chinese collegues, and at the same time (b) the Chinese realised that Westerners actually COULD pronounce words spoken in a foreign tongue and they didn't feel as much the need to make things easier for Western associates. It promoted a much more equitable atmosphere - BUT - here's where culture created a small awkwardness: The Chinese traditionally restrict the use of the given name to family members and very close friends, so I called everyone, even those I considered friends, "Mr" _____ or "Ms" _____ . As an American, however, I felt strange being called Ms. ____by my peers. Hey, we all coped. I read somewhere Chinese women's "Western names" were notable because they weren't 'trendy' but very old-fashioned. Mabel, Eunice, Edna, Bernice. Is there an element of truth in that? My name us Hershey, which is a variant of the Yiddish Herschel. I'm not sure why, but in business email correspondence people assume I'm female. I find that I get more easily my way with this misconception, so I don't feel like putting them straight. In Southern California, Latino immigrants are encouraged to keep their names as others seem to make a serious effort to pronounce their names as they are pronounced in Latin countries, ie. trilling the "r" in Maria for example. I don't know if this results in less name changing among Latinos. The Chinese, perhaps despairing of Western ears remembering their native names, routinely rename themselves upon coming to the United States. The Chinese usually keep their old name among themselves so Meng-yei among family members will be Jennifer at work. The amount of effort involved in pronouncing people's name with the correct ethnic inflection varies with the importance of ethnicity in the institution. Nobody bothers to trill the r's when speaking to Alec Rodriguez, the baseball player, but Alec Rodriguez, the guidance counselor will have his r's dutifully trilled by the school's Anglos. I'm not sure what to make of any of this other than teasing out a correlation between success and naming conventions strikes me as very difficult.